The flat stone to Robert Nairn is located in the old churchyard at Bonhill. The gravestone has been cleaned a number of times by the SCMA. This was a Bonhill man called Robert Nairn. Nairn was a shoemaker and a Covenanter, and he refused to attend Bonhill Parish church, which was now part of a church headed by bishops, with McKechnie as minister. It had become a criminal offence not to attend Church, and he had to leave home and hide out with friends, or in the open, from the officers of the law from Dumbarton who were very actively hunting for him. Amongst the places he hid out for a time was Napierston Wood. However, the cumulative effects of what we would now call living rough, caught up with him, and, very ill, he returned home to die on 15th April1685. Even in death, the Church still hounded Nairn and McKechnie refused him burial in Bonhill Churchyard. However, by this time the locals had had enough of the Church's attitude, and some young local lads broke the locks on the Churchyard gates and guarded his burial service in Bonhill Churchyard. 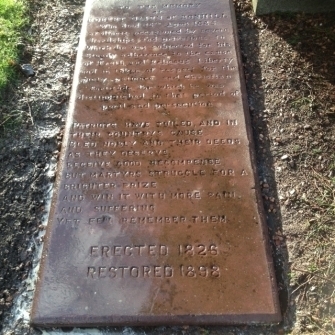 A descendant, Thomas Nairn of Bankhead in Balloch, erected a gravestone on his grave in 1826. Local tradition had it that he had been sheltered for a time in the farm of the McAllisters of Mid-Auchencarroch (who held on to their strict Covenanting views until the 1850's and beyond) and sure enough, when in the early 1800's a barn was demolished during renovations of their farm, a secret room was uncovered behind a double gable in which they found Nairn's lapstone, just where he had left it 120 years before. Other of Nairn's artefacts seem to have been passed down within the family and other of his descendants, the Nairn Marshall's who became wealthy in the 19th century and built and lived at Dalvait House in Dalvait Road Balloch until about the Second World War, loaned some of them to be displayed at the Empire Exhibition at Bellahouston Park, Glasgow in 1938. They seem to have been lost from sight since then.